Whistle Stop Toy and Hobby began as a dream. Frank received his first train from his Mom and Dad when he was just 18 months old. Memories of the sound of that first train whistle and the joy he shared with his family have been with him ever since. Frank has been collecting trains all of his life. For the past fourteen years, Frank has traveled around the country sharing his love of trains and attending train collector’s shows. His travels provided him with the opportunity to make many friends throughout the United States and to also amass an inventory large enough to open a retail store. Whistle Stop Toy and Hobby opened its doors May 1st, 2005! 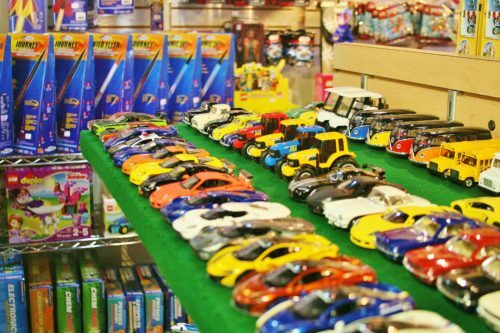 Today, Whistle Stop Toy and Hobby carries many of the memory building toys of Frank’s childhood including trains, Legos, rockets, model kits, remote control, slot cars and much more. Whistle Stop Toy and Hobby is moving full steam ahead and growing every day. Our primary goal is to create a place that families look forward to experiencing throughout the year. Through our picture window parents, grandparents and children can gaze at the magical Spring, Halloween and Christmas displays and have fun picking out special features of our train layout. In addition, it is our passionate mission to provide the absolute best and most personal customer service to each and every person that comes through our door from the 1-year-old customer to the 100 year old! We want to be a place that makes memories for a lifetime! We have been thrilled to participate in events throughout Alexandria including “First Thursday” events in Del Ray, “Second Thursdays” events in Old Town, the Care for Kids program with Children’s Hospital, the Campagna Center’s Scottish Christmas Walk, the Lyceum’s Railroad Days and the Harry Potter Book 7 Launch Night Party. We do special clinics and events with many of the Alexandria preschools, schools and scout troops. We have developed outstanding working relationships with local retailers, restaurants and hotels and have nurtured many positive partnerships. Many of these partners have joined us as we make plans for our annual Santa Railway Express, which is a memorable train ride from King Street Station to Manassas and back this Holiday season. We have also enjoyed the support of the local media including the Alexandria Gazette Packet, the Alexandria Times, the Del Ray Sun, The Old Town Crier, the Alexandria Guide, the Washington Post and Where Magazine. We are members of the Alexandria Chamber of Commerce and the Alexandria Convention and Visitor’s Association. We also have also aligned ourselves with the National Retail Hobby Association, the Train Collector’s Association, the World’s Greatest Hobby National program and local train, model and r/c enthusiast clubs. In addition to these networks, we promote hobbies, our store and Old Town, Alexandria up and down the East Coast as we travel to hobby shows in numerous venues. We are brimming with enthusiasm for our business and look forward to a future full of learning, growth and, especially, family fun! Enter your e-mail address to receive regular updates from Whistle Stop Hobbies. Get the latest info on what we have in stock and other exciting news about the toy and hobby world!